After the birth of three bouncing boys in four years, George III and his consort, Charlotte, were more than ready for a daughter when the Queen again found herself pregnant in 1766. Their hopes were realized on September 29 with the birth of Charlotte Augusta Matilda, who was immediately declared Princess Royal by her delighted papa. It is a style bestowed on the eldest daughter of a reigning monarch—and Royal more or less became her nickname from then on. It was an appropriate name: she would in time be the eldest of six sisters, not to mention six other younger brothers. 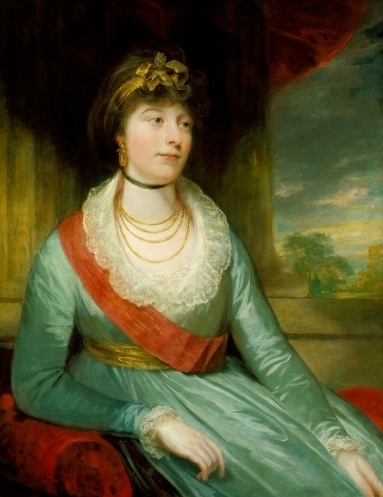 Royal and her two next sisters, Augusta and Elizabeth, were raised more or less at their mother’s knee; the Queen involved herself in all aspects of their education, which was rigorous but also emphasized the arts and “womanly” accomplishments such as sewing, painting, and other handiwork. Royal in particular was carefully educated in history and languages, for she was destined to make a very grand European match one day—or so it was planned. By the time Royal was of marriageable age, however, Europe was a very different place: unrest in France was brewing, unsettling most of Europe...and in 1788, George III suffered from his first attack of “madness,” which lasted a year and changed the dynamics of the family forever. The Queen clung to her daughters, not wishing to lose them to foreign marriages; the King himself, in fragile health, also was reluctant to let them marry, possibly influenced by the terrible experience of his own younger sister’s marriage to the King of Denmark. So Royal languished, longing for a home of her own; she and the Queen did not bring out the best in each other, and tempers grew short as the Queen continued to treat her grown daughters like children and the King to refuse offers of marriage. But in 1797, after nearly two years of backing-and-forthing, the King finally consented to allow Royal to marry. Her groom was the widowed Hereditary Prince Frederick of Württemberg, heir to the reigning Duke of Württemberg; though he was enormously fat, rumored to be bad-tempered, and had a previous marriage which had ended mysteriously, Royal was delighted to finally be escaping. Their wedding was in May, and in June the couple left for the continent. By August, Royal was delighted to write home that she was pregnant; in addition, her father-in-law’s death a few months later made her and her new husband the Duke and Duchess of Württemburg. But a quiet life was not to be theirs: war between France and Austria often overspilled into the duchy, and then Royal’s child, a daughter, was born dead. 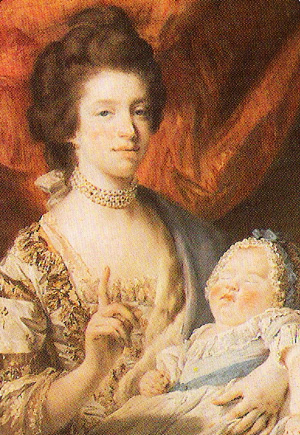 She had no more children, but became a very loved step-mother to the Duke’s children and indeed was very popular among her new subjects. In 1800, Württemburg was overrun by the French, and Royal and her new family fled to Austria. The Duke chose to negotiate with Napoleon, and in time was reinstated as Elector of Württemburg and then in 1806 as King, joining the Confederation of the Rhine. Royal’s step-daughter Catharina was married to Napoleon’s brother Jerome. Poor Royal was now officially the enemy of her birth country, which she felt deeply. So it was probably much to her relief that the Duke switched sides again in 1813, and rejoined the Allies. After Napoleon’s fall he was re-confirmed as king of his enlarged kingdom but did not have long to enjoy his position; he died in 1816, leaving Royal a very wealthy widow thanks to her large dowry. Royal professed herself heartbroken, but her family wondered; rumors over the years of his abusive treatment of her had reached them even during the war years. But she settled into a comfortable widowhood, being very attached to her step-grandchildren, two of whom she was raising, and growing so fat that she was forced to adopt the use of a Bath chair to get around. Various brothers and sisters came to stay with her, and finally, in 1827, she herself returned for a visit to England, thirty years after she'd left it. Her reunion with her remaining siblings and the chance to meet their children, among them Princess Victoria, was on the whole a happy one...and didn’t take place too soon, for growing ill-health was to catch up with her; she died in 1828, and was buried next to her lost daughter. Note: for anyone interested in Royal and her sisters, I can't recommend highly enough Flora Fraser's excellent group biography, Princesses: the Six Daughters of George III--a highly readable and sympathetic view of these quintessential "poor little rich girls."